Mail-order Catalog, Charles William Stores Inc., New York City, 1918. With less bulky clothing, sanitary aprons became a lucrative sideline of the feminine care industry. Women needed to keep blood from leaking napkins from staining their clothing, and the rubber-coated apron shielded their skirts. While sanitary aprons and other menstrual products were advertised as affordable, they could be too costly for poor women. 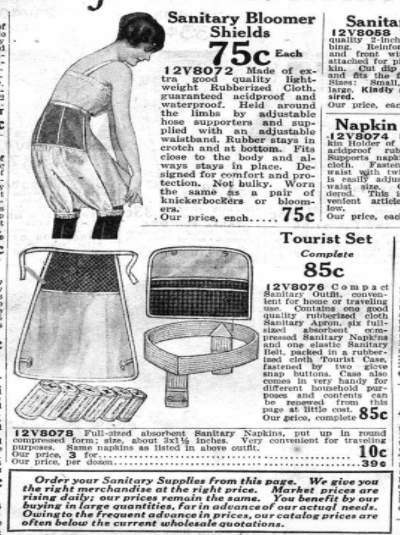 Based on the prices in this ad from 1918, a travel kit like this, consisting of a sanitary apron, six sanitary napkins, and an elastic sanitary belt, cost 85 cents — approximately $13 in today’s money.